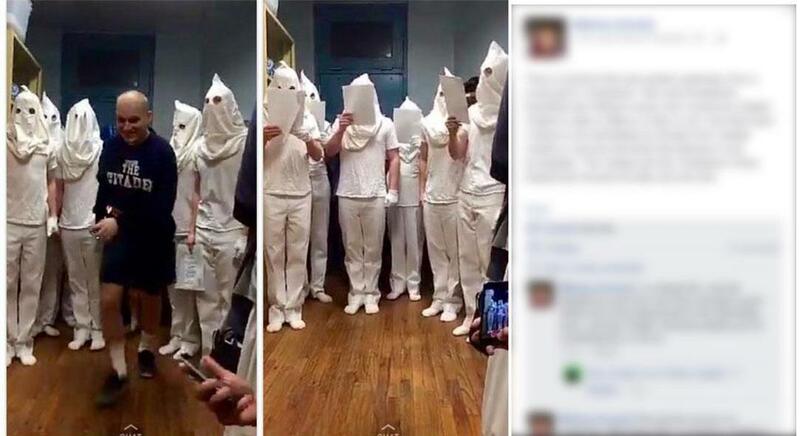 Citadel KKK costumes? School says it was a Christmas carol thing. The offending photos, via a South Carolina ABC affiliate. A social media posting, which I find offensive and disturbing, was brought to my attention this morning. It shows an upper class cadet in front of seven cadets with pillowcases over their heads. … Preliminary reports are cadets were singing Christmas carols as part of a “Ghosts of Christmas Past” skit. I don’t have any firsthand information here, but I’m going to go out on a limb and assert it as fact that, even if they were also singing Christmas carols, these white students at a South Carolina military institution which officially displays the Confederate flag were probably not unaware of the historical-political symbolism involved in wearing pointy white hoods. The white pointy hood is a pretty well-known symbol, here in the United States.